Slavi Trifonov was born on October 18, 1966 in Pleven. Slavi was guided into the field of music by chance during his school years. He was noticed by specialists from the music school in the city and they sent a letter to his parents. Thus Slavi began his musical education. Slavi graduated in 1985 from National School of Arts “Panayot Pipkov” Pleven with viola. He completed his military service from 1985 to 1987. He has graduated the National Academy of Music “Pancho Vladigerov”. In 1992 still a student he appeared in the student show “Ku-Ku” as an actor. Only two years were needed for him to become extremely popular and his ideas for further development in the field of show business to take shape. After “Ku-Ku” Slavi was producer and host of “Kanaleto” (1995 – 1997) and “The Exiles” (1998-2000). Since 2000 Slavi has been producer and host of “Slavi Trifonov’s Show”, the TV program with the highest rating in its field in the country. Slavi has invited to his studio world famous personalities and hundreds of popular and prominent Bulgarians. 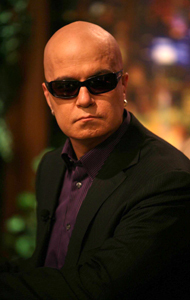 It is said about Slavi Trifonov that he is an outstanding personality in Bulgarian show business. Slavi on the other hand states that the best thing that happened to him in life is Ku-Ku Band. Slavi Trifonov has repeatedly led various campaigns aimed at a better way of life: against the government of Zhan Videnov, fighting for the release of Bulgarian medics in Libya, he has commented and used satire on hundreds of social and political problems… At the same time he does everything possible to make popular examples of strength of human spirit and combativeness. As a performer he has participated in 21 albums with “Ku-Ku”, “Kanaletto”, “The Exiles” and Ku-Ku Band.